Enjoy premium quality and quick release convenience with this innovative line of windshields. The SwitchBlade® system is highlighted by its unique Quick Release mounting hardware which gives you the ability to easily install or remove your windshield in less than 5 seconds – with NO TOOLS! 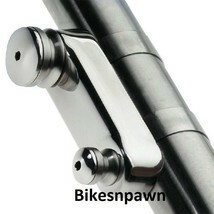 Mount kit that is designed specifically for your model bike accepts any size SwitchBlade® windshield.